It's only appropriate that one of the most swinging bass players in jazz fills his quintet with musicians known for their high level of musicianship. 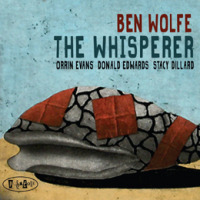 The others, particularly Strickland and Perdomo have built their careers in the format Wolfe showcases at this very special show which features some of his most striking compositions. Born in Baltimore, Maryland and raised in Portland, Oregon, Ben has gained a large following from his performances with Wynton Marsalis, Harry Connick Jr., and Diana Krall. Early on in Ben's career, he formed a Duo with Harry Connick Jr. and went on to record over a dozen albums and soundtracks. During his five years with Connick, he performed on numerous world tours as musical director. He then joined the Wynton Marsalis Septet and remained until it disbanded. Ben also became an integral part of Diana Krall's touring band and played on many of her recordings, including the Grammy Award winning CD, When I Look In Your Eyes." As a member of The Jazz at Lincoln Center Orchestra (JLCO), Ben has performed with Joe Henderson, Doc Cheatham, Jon Hendricks, Harry Sweets" Edison, and Billy Higgins. Other artists he has also recorded with include Branford Marsalis, James Moody, Eric Reed, Carl Allen, and Benny Green. In addition to his latest CD, Ben's previous recordings include 13 Sketches" (1996) and Bagdad Theater" (1997), both released on Mons Records; the critically acclaimed Murray's Cadillac" (2000) on Amosaya Music; and My Kinda Beautiful" (2004) on Planet Arts Records & No Strangers Here" (2008) on Max Jazz. 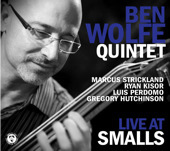 Ben is currently on the teaching faculty at The Julliard School : Jazz Division.